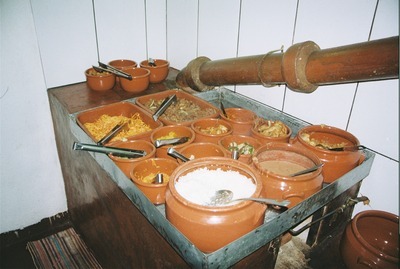 A traditional buffet of comida mineira, the food of the State of Minas Gerais, in the rural town of Arceburgo. The traditional foods of comida mineira are beans and rice, maize and manioc flours, pork, beef, chicken, and leafy vegetables – particularly collards -- and okra. "Newer" dishes include pastas, which were developed by Italian immigrants that arrived to Brazil in the late 19th and early 20th century.